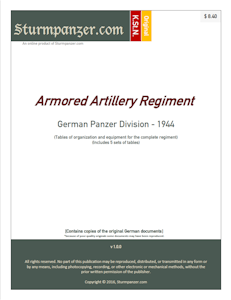 410 1.May.44 HQ and HQ Battery (motorized) for Panzer Artillery Regt. 405 (fG) 1.Jun.44 HQ and HQ Battery (motorized) for Panzer Artillery Btl. 407 (fG) 1.Jun.44 HQ and HQ Battery Armored Howitzer Battalion.